“Must. Start. Patenting. Everything.” Aaron Levie’s, CEO of Box, tweet after the historic $1-billion verdict against Samsung. In the world of technology, business patents have become one of the most important assets for any company. Back in 1885, inventor Graham Bell filed a caveat for a device that could transmit voices, announcing his intention to file a patent in the next three months. Bell’s caveat came hours before another inventor, Elisha Gray, filed one for a similar device he was working on. Those few hours made a huge difference. History knows Bell, and not Gray, as the inventor of the telephone. What is a patent? “A patent is a statutory right granted to an individual, a group of individuals or a legal entity to exclusively stop others from making, using or selling the invention that is subject matter of the patent,” says Rahul Dev, patent & trademark attorney and partner of law firm, Tech Corp Legal. An invention, as we know, is a solution to a technological problem. Patents are always territorial in nature — one that is granted in India and is enforceable only in the country. In India, patents are governed by The Patents Act 1970 and must fulfill the following conditions of being novel, having an inventive step, which is non-obvious and is capable of industrial applications. Why is it important for a start-up? For a technology start-up, a patent can have several benefits. Explains Deepak Gupta, managing director, PatentYogi, a patent consulting firm: “It helps protect your innovations from being replicated by competitors. It can be a source of revenue in future as patents are assets that can be sold or licenced. Further, it can provide a defensive cushion to businesses against any future patent litigation.” Investors also favour companies that own patents for the same reasons. Does my start-up need a patent? “If the core business of a start-up is based on technology that is innovative, it is highly advisable to file for patent protection,” says Dev. However, he warns that filing a patent merely on an idea without any focus on execution may not make much sense as such patents do not add much value to a business. Ideally, a patent should be filed before the product/service is offered to the public. Once an innovation is made public, a patent cannot be filed. “We could see various applications of our product in the field of entertainment and marketing. Considering our company’s road map and uniqueness of the solution, we decided to patent our product,” says Shivaranjan V. Kumar, co-founder, Rhythm Labs, a start-up that has developed an innovative social singing application where users can sing their favorite songs and match their voice with the original singer of the song. When should I file a patent? Says Gupta: “One key requirement of the patent law is that the patent application should include enough details that enable a person of ordinary skill in the art to implement the invention.” Start-ups, he says, should file patents as soon as they have a concrete idea of their invention. The date of filing is important as whoever files a patent first gets the right to the invention. It is generally recommended that patents be filed as soon as possible. Says Dev: “A provisional patent is a preliminary application that allows the patent applicant to obtain a priority date — file a provisional patent today and then have the right to file a complete patent within 12 months.” It allows the inventor to use the term ‘patent pending’ with their invention. “It is advisable in cases when companies need to present their offerings in public domain but are not ready to file complete patent prior to that due to various reasons such as lack of time, lack of funds, product not fully developed,” says Dev. However, if the inventors fail to file a non-provisional application within a year, then the provisional application expires and inventor loses the priority date. What do I need to check? 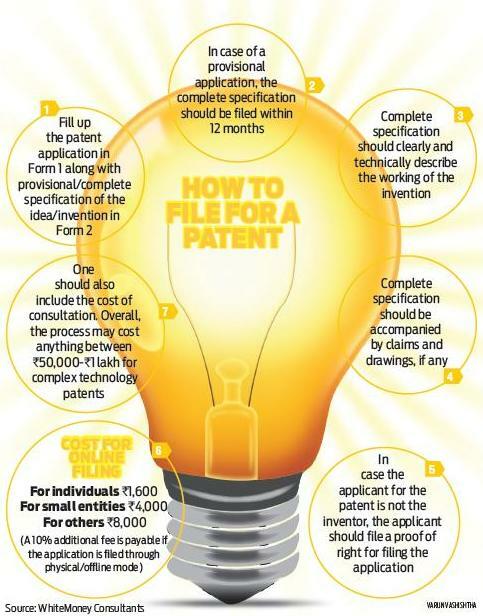 “A prior art search by a professional patent analyst should be done to ensure that the inventor is on right track and does not end up infringing over others patents/rights,” says Pavan Kumar of WhiteMoney, a Bangalore-based business consultancy. They can also help a start-up design a viable patent strategy keeping in mind a long-term view. As patents territorial in nature, one will be able to use a patent in India even if it is patented in some other country. However, whether a start-up can apply for a patent abroad might depend on its status at a global level. A start-up should look to protect its patent in all territories where it intends to sell or do business with its product.